2007 Fairchild Estate Cabernet Sauvignon Napa Valley. If someone says, “wine is for everyone,” I’ll bet the first thing most people think of is this wonderful new wine culture of enthusiasts and accessible tastings to discover new wines, and more importantly, new favorites. At the same time, most wineries are embracing that sentiment with enjoyable and well-made “entry-level” wines. Not to be confused (in most cases) with cheaply made wines, these diplomats travel the world and introduce indigenous grape varietals and wineries to enthusiasts via their value price in supermarkets and wine lists alike, which is great. What I discovered at Vinitaly, though, is that “for everyone” has a flip side, and actually means for every kind of person–from the casual drinker to the connoisseur, from the weekly budget shopper to the big budget collector. Think about it, it is the fine wines, ambassadors if you will, crafted by the top producers, which gain notoriety through scores and reviews in big magazines and are usually what create interest in the wineries in the first place. This “two sides of the coin” approach applies to most everything in life, and I can also relate it to my other passion, auto racing. There are many levels of competition, from amateur to elite professional; heck, even I have raced in an SCCA club race. But, it is the premier events that really build the interest in fans and participants. If there was no Indianapolis 500 or Monaco Grand Prix, would as many people have such passion and dreams to pursue the sport (Would I have belted myself in, scared out of my wits, just to experience what it’s like for myself) So let’s look at the other side of the coin this time, and celebrate the wines that put the wineries on the map and continue to inspire the public…and celebrate the people who are giving a little part of themselves in the crafting of their wines, no matter what their background. 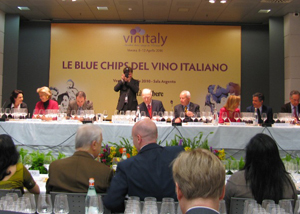 Each year at Vinitaly, there is an exclusive tasting event that happens exactly 24 hours after the expo opens. 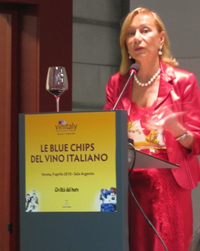 This year, I was invited to attend this event, the “Blue Chips of Italian Wine”, hosted by Civilta’ del bere, one of Italy’s leading wine magazines (www.civiltadelbere.com) which for me was like being invited to attend a UN conference. Representing over 40 countries, the 200 participants were journalists and “authorities of the international public of wine tasting” invited to experience how 12 top wineries in Italy are able to create wines of excellence in quantities large enough to support worldwide demand. 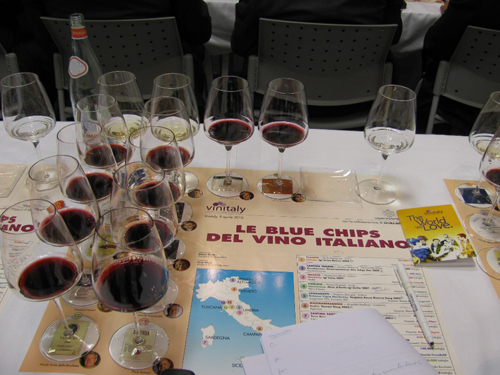 Borrowing from the stock exchange term for the companies who have the highest value based on the number of shares times price per share, the Blue Chips of Italy are those wines sold at a premium price while being produced in appreciable quantities. 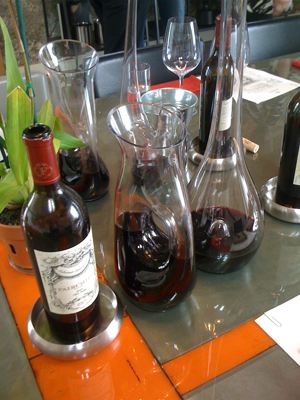 Qualifying factors were: being sold in all major markets in the world, and having won at least two awards of excellence from the five main national guides including Duemilavini, Gambero Rosso and L’Espresso, as well as nods from international critics such as Robert Parker and Wine Spectator. The first wine to be poured was Planta’s Cometa, IGT Sicilia Bianco 2008, and the parade of suited-up sommeliers from the AIS (Associazione Italiana Sommelier) with bottles in-hand was magnificent as they came streaming into the room. This 100% Fiano varietal wine, with a ‘juicy’ balance of acidity and complexity was an appropriate representation of the winery’s research into indigenous varietals. In the mid range of production at 88,000 bottles, this wine has a retail price of € 22, or $32. Moving through the lineup, the first wine I had experience tasting was Mastroberardino’s Radici Taurasi DOCG 2005. CEO of sales and marketing, Dario Pennino recounted a 2007 vertical tasting of this wine where the 1934 vintage was awarded 99 points by Gambero Rosso. This elegant and delicious 100% Aglianico wine which has won numerous awards and scores over 90 points, has a production of 80,000 bottles and a retail price of €25 or $37. Allegrini’s Amarone della Valpolicella Classico DOC 2005 was the next wine to grab my attention because, as an Amarone lover, I was impressed by the freshness and layered flavors of this wine made from partially dried grapes–a result of Allegrini’s preference for a more modern style than conventional taste. Retailing at €60 or $90, the production is 125,000 bottles. The Tuscan wine that left me wanting more was the Flaccianello della Pieve, IGT Colli della Toscana Centrale 2006 from Fontodi. It is This Wine Spectator 99-pointer made from 100% Sangiovese has enveloping aromas of ripe berries, spices and leather with distinct yet balanced tannins. A production of 50,000 bottles, this super Tuscan retails for about €60 or $90. Finally, the one I had been hearing about, the red giant, with the second-highest production at 180,000 bottles, San Guido’s Sassicaia, Bolgheri Sassicaia DOC 2006, made from Cabernet Sauvignon and Cabernet Franc. From its intense ruby color to the elegant aromas to the beautifully balanced silky cherry mouthful, I enjoyed every moment of my epiphany as I realized why some wines really do merit their high price tag, in this case, €130 or $195. I will never again roll my eyes at someone extolling the virtues of a wine like this, and learned that the flip side of the “wine for everyone” coin can be just as interesting and exciting. Though I am typically an advocate for indigenous varietals, this wine is without a doubt special. Cantina Tramin–Nussbaumer, Gewürztraminer Alto Adige DOC 2008. 55,000 bottles. Falesco–Montiano, IGT Lazio 2007. 55,000 bottles. Firriato–Harmonium, Nero d’Avola IGT Sicily 2007. 120,000 bottles. Lungarotti–Rubesco Vigna Monticchio, Torgiano Rosso Riserva DOCG 2005. 50,000 bottles. Cantina Santadi–Terre Brune, Carignano del Sulcis Superiore DOC 2005. 80,000 bottles. Ornellaia–Ornellaia, Bolgheri Rosso Superiore DOC 2006. 140,000 bottles. Antinori–Tignanello, IGT Toscana Rosso 2006. 350,000 bottles. This particular day, I concentrated more on the organized tastings than going from stand to stand (with 4,200 to choose from, you can end up in wine oblivion!). One I was particularly excited about attending was that of Podere Castorani winery in Abruzzo, owned by Formula 1 driver, Jarno Trulli. Racing season has started with its usual changes in rules, drivers and helmet designs, and while searching for news on the internet, I took a minute to check out Podere Castorani’s website (www.poderecastorani.it). When I saw that Jarno would be at Vinitaly to present his wines at a special tasting, I quickly called the winery to reserve a spot. Abruzzo is best known for it’s flagship grape, Montepulciano, and the region, amidst rebuilding after the earthquake last year, is determinedly moving forward in many aspects, including showcasing their other varietal gems, and showing how well their wines are aging. The Abruzzo pavilion, with the slogan “pleasing notes” referring to the wines as well as the region’s devotion to music, was spacious and full of large and small stands alike, with a beautiful tasting area and even a restaurant. As one tasting was finishing, crowds of people were gathering for the Podere Castorani presentation and I could see Jarno Trulli talking with whom I assumed to be some of his associates. The first thing I noticed was how low-key he seemed to be. I could see that this event was entirely about the family winery, no matter that he had just flown in from Malaysia, and in a few days would be returning to China for the next Grand Prix. I admit, this surprised me, and it made me even more interested to finally taste the wines and learn about their philosophy. For those of you who have witnessed other celebrity figures venturing into wine, take this into account: the family farm in Abruzzo was already established in 1793, and the 32 hectares of current estate vines are part of that original land. Fifteen years ago, the family and business associates decided to build a modern winemaking facility and 2000 was their first year of modern vinification. With this new facility, Jarno, coming from the world of Formula 1, wants to express the right balance between tradition and technology. We began the tasting with the 100% Trebbiano d’Abruzzo DOC Coste delle Plaie, with fresh and balanced acidity and minerality and flavors of citrus and exotic fruits. Next was the Pecorino Colline Pescaresi IGT from 100% Pecorino grapes, which delivered a silky fruitiness with some herbal notes, which made me think of enjoying it with a baked herb and cheese dish. I am a big fan of Montepulciano, and the next two selections, the Coste delle Plaie and the Amorino were both true to the grape and terroir, and I found the Amorina Casauria Montepulciano d’Abruzzo DOC with its deep ruby-purple color and balanced tannins to be the most delicious, like a mouthful of ripe cherry and plum. 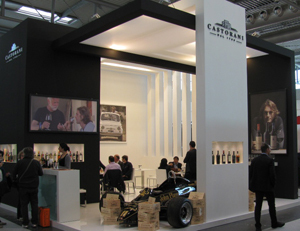 After the organized tasting, I spoke with the winemaker, Angelo Molisani to learn a bit more about the wines at their impressive stand complete with a vintage Formula 1 car at the entrance. While he poured and explained a few more wines from their lineup, Jarno joined us with one of the winery’s associates and I learned about their philosophy for the international market. The winery produces both estate wines and wines representative of other regions of Italy, like Barbera, Prosecco and international varieties like Syrah all grown in various regions, then vinified at the estate, allowing this smaller winery to offer a variety of wines representative of Abruzzo and all of Italy to international importers. Needless to say, the winemaker is extremely busy, but loves the work they are doing. While pouring the Cerasuolo Montepulciano d’Abruzzo DOC 2009 Rosato, Angelo was explaining a typical dish that might be enjoyed with this wine, the Abruzzese specialty, “Brodetto”, a stew made with tomato, peppers and different kinds of fish. Angelo explained that Jarno’s father Enzo, who loves to prepare this dish, is an excellent cook and is planning to open a restaurant, much to the delight of those who enjoy his talents. As for me, I can’t wait to try the Brodetto and happily accepted an invitation from Enzo to visit the winery and try this local delicacy with their wines. The “wow” wine of the day was the Podere Castorani Montepulciano DOC 2004, the original wine produced by the estate, and what they call “the beginning of the story.” If “comfort wine” was an acceptable description, I would use it here. Well-balanced body and tannins, with beautiful color and flavors of spices and berries make this a wine for a meal that you wish would never end. And though I didn’t really want my experience to end at Podere Castorani, it was time for me to move on, and for them to share these great wines with other enthusiastic visitors. I look forward to visiting the winery soon and seeing the beautiful terrain of Abruzzo, with its mountains, coastline and devotion to nature. As for my impressions of Jarno, for someone who would be justified in safeguarding his privacy, as one of only a handful of elite drivers in the sport’s highest echelon, his availability and genuine interest in this event was impressive. If his hope is to achieve a balance between tradition and the fast-paced world of Formula 1, I’d say he has achieved that in his winemaking and in his lifestyle. Bravo. 2008 Brewer-Clifton Pinot Noir “Melville” Sta. Rita Hills. The Melville 2008 Pinot is the fullest and most intense of the Brewer-Clifton line up and feels like the youngest with a firm structure and more tannins, though it should soften and round out nicely. I am very sure this is a Pinot to get and watch for over the next couple of years, as it should develop lots more layers and complexities. That said, most of you that have had the Melville will love it, and love it now! Bold, intense, young and layered with black and dark fruit all through, rich palate, great depth, plum, cherry, currant, black fig, firm structure, but very long on the finish. Wind swept site planted to 114 and 115 clones, long hang-time adds complexities and the wine seems darker in color. Grapelive Special Report: Fairchild 2007 Releases Preview Tasting at 750 Wines, St. Helena, Napa Valley. The Fairchild Estate is releasing their tiny production Cabernets from the 2007 vintage, two wines, one from Lawrence Fairchild’s hillside vineyard and home property, and the other from the famed Beckstoffer sites, mainly the George III Vineyard and some of the prized To Kalon Vineyard, both from selected blocks. 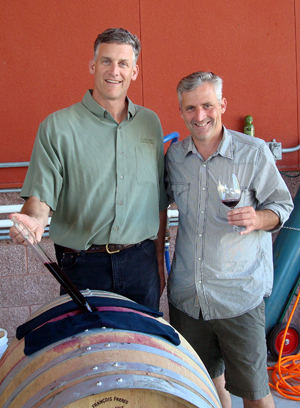 Fairchild continues with Paul Hobbs as winemaker and consultant and again has made stunning and layered wines with the outstanding grape sources available to him. The is no question these wines are some of the most interesting, rich and compelling Cabernets I’ve come across, and I was massively impressed with this estate’s 2006 offerings, of which I wrote about a few months back, though the 2007’s look to be more complex and slightly deeper overall. It was a great pleasure to meet Lawrence Fairchild and get to know him and his vision, to understand what he was after in his wines and how he got started. I find it intriguing where people come from, how they became passionate about wine, and to get inside their heads a bit, and I must say Fairchild is as impressive as his wines, while being easy going, humble and engaging. He also is almost a one man show when it comes to his label, except that he gets great people to do what he can’t do, Paul Hobbs to make the wine and Jim Barbour to tend to the vines show his total commitment to making the best wine possible. Though, every detail is managed by Lawrence, and he oversees everything with great pleasure and intensity, he is the kind of guy that can read the data, understand the science, but also can feel the nature of the vineyard and enjoy it all on every level. Fairchild says his main interest is being close to his vineyard and understanding the vines, he comes from a farm in Nebraska and grew up reading the crops and knowing what would come at harvest time. This makes him very aware and sensitive to the needs of the vines, so he has one of the best vineyard managers in Napa on call to make sure his vines give the best grapes possible, though this level of care doesn’t come cheap and Fairchild spares no expense to get the best out of his vines, even though they yield only about a ton and a quarter an acre of fruit, that is a tiny amount per plant, but it means total quality. I must say, for what those four barrels cost, you have to admire the passion and effort that he puts in, and the wines show it. Paul Hobbs, one of the premier winemakers and consultants, makes wines that show great richness and depth, but without severe tannins or overripe flavors, all of which led Fairchild to search Hobbs out in the first place, and reflect the style of wine he wanted. Lawrence spent time in the late eighties taking wine classes and tasting seminars in San Francisco learning about and trying Bordeaux and Burgundy wines and got hooked on them, fast becoming more and more interested in wine and vineyards. He says his first big “Ah Ha” wine moment came when trying a 1990 Premier Cru Red Burgundy that was one of the wines that really put the bug in and pushed him to explore wine more completely. Lawrence also said at the time he had fun buying Chateau Palmer and other quality Bordeaux that at the time were very affordable and gave him a chance to develop his palate. When asked about his early experiences with California wines, he very interestingly said that he was into Zinfandel and mentioned Biale, and then later Outpost as wines he really enjoyed. He credits this time of his life to wanting to make elegant wines that show balance and never too much sugary sweetness or oakiness, as he had long admired the great Chateaux of Bordeaux. 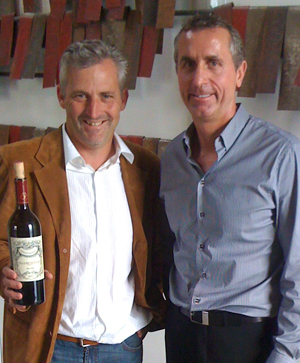 With Hobbs, Fairchild has succeeded and his wines are very true to his vision and he can be proud, as they are very much like the best vintage Bordeaux in quality and texture, even if they will not be mistaken for the French wines, they certainly have to class to compete against the world’s best. Fairchild says he devotes about 30 to 40 percent of his time to his estate, where he lives and the vineyard that makes the estate Sigaro Cabernet Sauvignon, and the rest of his time goes into his consulting and start up business, he went from a farm boy from Nebraska to an investment banker in San Francisco, where he ended up successfully helping companies develop and he has made a name for himself as a savvy investor. His current project is with a small company that is working with the University of Maryland, building a hub for information on the research and treatment of H.I.V globally, looking to create a worldwide database so that doctors and scientists can get the latest results and patient reactions within minutes. They want this global hub to be easily accessed and even easier to upload information to, in fact they are trying to make it so doctors even in remote villages in Africa can do so by using their cellular phones, as there is not much in the way of landlines or broadband in these poorer areas. This seems like an amazing project and one that can make a huge difference in the lives of millions of people, and I am hoping he sees this become as successful as I feel he has achieved in his wines. Without a doubt Lawrence Fairchild is a remarkable guy, and has impressed me with his dedication and pursuit of quality in his life, you just have to admire the grit and energy he puts into everything. He also proves you can be a great success and still be real nice guy and have humility in your relations with people, maybe that is the quality I liked most after meeting him, well then, the wines were pretty darn good too. The 2007 Fairchild Estate Cabernet Sauvignon Napa Valley, a cuvee of 88% Beckstoffer George III and 12% Beckstoffer To Kalon, is almost a complete change from the 2006 Napa, as that wine had much more To Kalon and some Star Lane, but may just be all that much better for the switch to mostly George III, one of the most famous Cabernet Sauvignon vineyards in the valley. The wine certainly has more power and structure than the 2006 and will age like a champ, it shows intense fruit that is balanced by ripe, but firm tannins and while it will develop many more interesting layers given time, it all ready has complexity and depth that few 2007 show yet. I still think it would be best to put a few bottles away from 5 to 10 years; the wine would be great with food right now, tonight even. Everything is there to be a true classic, and the proof is in the details, a great vineyard, small production and a great winemaker, you can bank on this wine. The nose is showing hints of floral, mineral, smoke, red and black fruit, while the palate is alive with classic Napa Cab flavors, blackberry, blueberry, currant, crème de cassis, menthol and fresh tobacco leaf and cedar. Nothing is out of place here, the mouth-feel is full and lush, but still very dry and gripping, plus the flavors feel fresh and lifted with some gentle acidity. This serious wine will pump out layers of greatness for decades, of that I am confident, very much like fine Bordeaux, though more true to its own terroir. Fairchild’s Signature wine is the estate Cab, the 2007 Fairchild Cabernet Sauvignon “Sigaro” Napa Valley. This amazing wine is all ready very compelling with a hedonistic and fragrant bouquet of perfume, violets, lilacs and other wildflowers on the nose with touches of cedar spice, black fruits and vanilla. All this before you even taste the wine itself, which is a good sign for things to come, and good things do come on the palate, in force too. The mouth is filled with black currants, mountain berries, cherry liqueur, blueberries and crème de cassis, while in the background there is plum, melted licorice, a sage like spice and cigar box. A nice elegant cherry and cedar element come out too after some air, as does some mocha, almost chocolate like notes add complexity. All the layers unfold beautifully and as all the wines I’ve tried from this estate everything is well balanced with a very defined focus, while the tannins are well integrated and ripe, giving solid structure with any harshness. This wine is a gem, and pretty close to a masterpiece, I look forward to seeing this wine evolve and trying the next few vintages, as I suspect this tiny vineyard is going to keep producing better and better grapes over the years as it gets age. 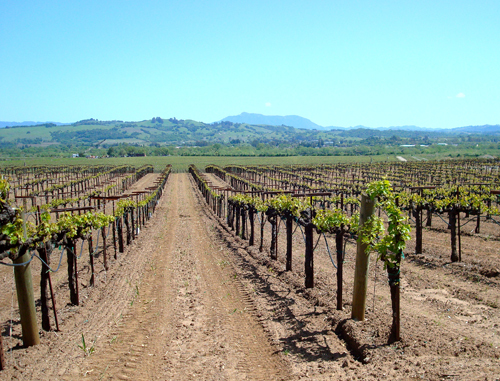 This vineyard located on the Eastern side of the Napa Valley is close to Lake Hennessy and near Howell Mountain up Conn Valley Road in an area that has good exposure and rocky soils, all of which Cabernet loves. The Sigaro also gets a small touch of Petit Verdot, something like 3% and while that is not much really, it does add a bit of color and gives a little something extra to the wine according to Hobbs and Fairchild, and I did notice the Sigaro looked a shade darker than the Napa Valley, and since they tasted the barrels to make the wine they must have thought it important to splash the Petit Verdot in the blend. This wine is so far my favorite 2007 Cabernet and is a fantastic Cabernet that will both age decades, and drink great whenever you decide to open a bottle, a hallmark of a great wine in my book, and this is the real deal. *As these wonderful wines are extremely limited, both of which production was a mere 100 cases, or four barrels, I say thanks to Lawrence Fairchild for pouring them for me and a huge thank you to 750 Wines in St. Helena for continuing to invite me to taste such one of kind wines and introducing me to new wineries and great people that have a real passion for what they are doing. I feel very honored and hope my humble feedback helps them get insight into how these wines will be received when then get out on the market. David and Monica Stevens at 750 Wines are paving the way for a new age era wine merchant model and I think they are doing a terrific job and provide sublime service. 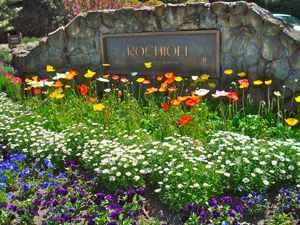 If you are a wine lover and or collector you need to check them out when you are in Napa, you’ll be rewarded no doubt. 2007 Fairchild Cabernet Sauvignon “Sigaro” Napa Valley. The Russian River Valley never ceases to amaze me and I find new hidden corners and gems each time I visit, plus I have habits that need feeding, so I swing by some of my usual suspects almost each time I get up that way. Now that I live in the backyard basically, it was an easy drive on a wondrous and warm spring day, and my mood for adventure has just that much brighter. 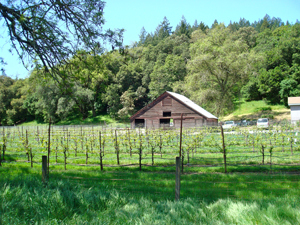 Off Highway 101 at Healdsburg, resisting to strong pull to slip into town and hang out on the plaza, I lefted and headed into the wine country on Westside Road that is the line between Dry Creek Valley and the Russian River Valley regions. Westside veers left about a mile down and you fast approach the fancy of my heart, Rochioli and the gateway to the wineries in the area though a series of twists and turns down the river itself at certain points along the way. For me, a long time fan of Rochioli, I just can’t pass the place, even to just stop and taste the current releases and see the winery cat, but alas Sweetpea wasn’t hanging around the busy tasting room on this day. Rochioli had only wines that I have reviewed and talked about at length just recently, so it was on to something new. With early green leaves sprouting and a hot and brilliant sun shining through the vines, it was truly a magical drive and still without the slowpoke summer travelers to hold me back. The vineyards are beautiful all year for me, but spring is a special time to see them, especially when they are framed by so much green, in the hills and trees and everything thing takes on a sharper dimension, bluer sky and greener leaves come more vibrantly into focus at this time. Passing these scenes just gives you a bigger smile, a feeling of well being, and may even make the wine taste that much better. I pulling off at the old Davis Bynum property, now called Thomas George Estates, these guys are new and I’ve not heard a word about them yet, so here was the chance to get my first impressions. I must say, they have done massive upgrading to the place and I was awed by the commitment they are putting into a small family winery, everything is new and well planned out, and they even dug a cave into the hillside, very rare for the Russian River, and no detail has been overlooked. They are new here and are still filling the cave up with their red wines, from the 2008 and 2009 vintages, while the 2009 whites are under the winery keeping cool. I got a great tour from Eric Demuth, an up and coming wine maker in his own right, who is helping out at Thomas George Estates. Eric’s dad used to have an Anderson Valley winery name Demuth, but has since sold out and retired, though still selling his older vintages out of his Mini Cooper. Eric’s label is Demuth Kemos, and has some limited Cabernets and a Chard available, and I will get back to you on them when I get chance to visit his own winery at a future date. 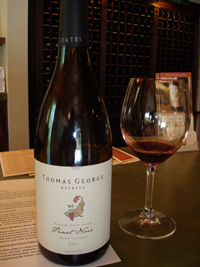 Back to Thomas George, and their wines all of which are well made and the whiles were especially refreshing. I enjoyed their stainless steel fermented and aged Viognier and Chardonnay, then Eric showed me the 2007 Pinots, one from estate vineyards and a special bottling of an “Allen Vineyard”, those who know the famed Williams-Selyem and Gary Farrell would have heard of this top vineyard, similar to Rochioli “West Block”, and finally a tasty Dry Creek Zinfandel. The Pinot Noir selection was the highlight, and both showed great on this day, but that “Allen” really got my attention. I am looking forward to coming back here regularly to see how things progress, and hike up to the vineyards again, they put a path in that leads up a steep forest grade to a vineyard that overlooks much of the valley and helped give me my exercise for the day. Pushing on South in direction I made my way to one of the long time old school wineries of the region, after leaving Westside Road, twisting east on River Road, I exited up Laguna Road and tucked away about a mile is Joseph Swan Vineyards, close to Forestville and one of the pioneers of the region. I used to have Swan often by in the eighties and nineties, though have not followed them that closely in recent years, so it was fun to go here and see how the wines taste now. Joseph Swan is still very old school, and the wines are packed with tannins and acidity, making drinking young wines next to impossible, except for the Chardonnay. These wines take me back, though I must say, they seem very had and out of date when compared to what is available of great quality on the market from the region. 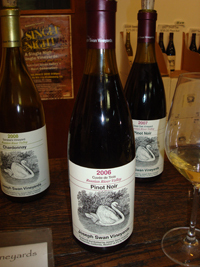 The contrast is dramatic, but I’m sure those who put a few bottles away, or like to cellar their wines will be rewarded by stocking away some of the 2007 Joseph Swan Pinots, especial the powerful and tight “Great Oak Vineyard” wine. The Chard was very clean and ripe, the 2006 Cuvee de Trois Pinot was almost ready to drink and quite enjoyable, the monster Hermitage like 2005 “Great Oak Vineyard” almost ripped my palate to shreds, you might give this one another decade, then there was an odd ball, the 2006 Tannat “Matthew’s Station Vineyard” that was very raisiny and had a Port like character, not to my taste at all, but it seems to sell well and have homes to go home to, though it is nothing like a good Madiran (a Tannat wine from South West France). Swan also does lots of Zinfandel, and I tried the 2005 “Mancini Ranch” and again thought it would be best to give it more time as it was too tight and spicy still. No question, if you want to taste some throwback wines, that really are for the cellar, Joseph Swan is your must visit place when you get up here, they continue to produce wines in their iconic and classic style, true to their heart. After Swan, I was interested in seeing the most modern and extreme example of Russian River wines would taste, so I continued East now on River Road to Martinelli Winery, a modern classic if you like. 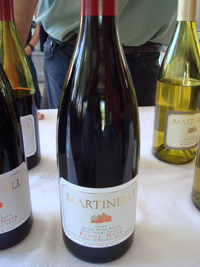 Under the guidance of the famed Helen Turley, Martinelli has become the stuff of legends, making big fruit driven wines that go down well with all the critics. These ripe high alcohol wines sometimes are too much for me, especially the Zinfandels and Syrahs, but as mentioned they have an almost cult like following and get big scores. I must admit, I really do like the Pinot Noirs and even covet their Chardonnay at times, and I must say the Martinelli’s are great people, down to earth and very friendly, so it would be hard not to love their wines. Today was made even better than I could even imagine, it was their private customer wine pick up day, and they had a special event going where they were pouring some very rare releases and even some 2009 Pinot and Syrah from the barrel! Of course, they would let me in off the street, right? Well, they didn’t call the cops and in fact everyone was amazingly friendly and I got to taste all the wines, both in the tasting room and at the special pouring near the crush pad out back. I must be lucky sometimes, this I know and am grateful, and today was working out perfectly with no problems or even a wrinkle, so I even was able to taste through the Martinelli line up with George Martinelli, a tall charming man that heads up the farming side for the family winery. He took me through all the wine and even pulled wine from barrels for me, again I must thank my lucky stars and thank George as well, as he made an all ready good day great and it was great to hear about the vineyards and vines from someone that is so close to them and knows them all. I was sadly only a taste and spit guy today, which caused some interesting looks from the faithful, though the Martinelli’s understood perfectly, though spitting into a drain on the floor doesn’t look pretty! But, we are professionals here and some of these wines were pushing 17% alcohol, so regardless of not looking cool, it had to be done. That all said, and in good humor, these wines had wonderful depth and flavors that did make me wish I had brought that designated driver everyone talks about. Martinelli is losing Helen Turley after this year, but don’t worry about a thing the same guy that was making the wine under her is staying, Bryan Kvamme, and he is the real deal and will keep Martinelli at the top of their game for years to come. Bryan was there today as well, holding down the Zinfandel table and pouring the fabled “Jackass Vineyard” to great fanfare I must add, that was a very popular spot today. The wines that really stood out for me, as good as all of them were, had to be the 2006 Three Sisters Chardonnay, the 2007 Bondi Pinot, the really amazing 2007 Moonshine Ranch, the 2008 Bondi Pinot and the 2009 Zio Tony Pinot from barrel. Before everyone screams at me, I will say the Jackass Zin and Giuseppe & Luisa Zin both showed very well too, though the only Syrah that jumped out to me was the 2009 barrel sample. It was interesting to hear that they plan to expand the Syrah line up and that they are looking to it to be their driving force red in the future. Certainly, they know what their customers want and even if they are not to my taste, these wines are very well made and receive lots of great press. And as I said, I really liked the 2009 from barrel, so be your own judge and try them yourselves. There is no doubt about it Martinelli Winery and the Martinelli family, starting here in Sonoma back in 1860, are a class act and it was with great respect and even greater pleasure to see them and taste their wonderful wines. It is hard to beat the wine county in springtime, and the Russian River Valley is one of my very favorite places to be, and days like today will keep me coming back even more. The people and the region are special treasures and it is an honor for me to call them neighbors now and get to know them on a new and more personal level. It is a joy to have guys like Eric Demuth and George Martinelli enlightening me to the insider ways of the Russian River and to learn about what is next for the areas wines. This place is special and I have high expectations for the future up here, with old and modern ways, old and new clone vines, and good stewards of the land, you can have it all and it tastes sublime. 2008 Brewer-Clifton Chardonnay Sta. Rita Hills. White flowers, lemon curd, fig and kiwi all going nicely with core peach and pear fruit. Bright, perfumed, tangy with citrus notes, subtle oak and mineral. I was quick to rate this wine, and after going back to it, I might be well served to raise the score, this is a very pretty and complex wine that is only going to fill out in the next year…. Note to self, revisit soon… Brewer-Clifton started the Sta. Rita Hills series last year, and these wines are their banner wines and are made from the top lots of each of the Cru vineyard sites! They are a great value and are not seconds or lesser barrels, these wines are everything the single vineyard wines are, as they are a cuvee of all of them put together. 2008 Sean Thackrey Orion Rossi Vineyard, St. Helena, Napa Valley. This is one of the most sought after reds in California by a select group of wine groupies! And collectors of course…. Thackrey makes truly unique and one of a kind wines that reflect terroir, and imaginative winemaking in an extreme location, he lives almost on the edge of the world in Bolinas, on the West Marin coast, and this also adds to the flavor of the wine. The Orion is his creative masterpiece and signature wine, and the fruit comes from old vines of which we know includes Syrah, but many other grapes are in there, right? I don’t think anyone ever thinks of the type grape when tasting any of Thackrey’s wines, as they go beyond classification and are totally beyond normal description, but then that is what makes them special and intriguing. This vintage of Orion is amazing and I find it complex and wild, though not as funky as the last couple of vintages, with fresher and more vivid flavors. The nose has a briny, earthy quality per normal, but it also has clean fruit notes and is not as gamey or reduced as it can be. Don’t get me wrong here the last few vintages have been stellar wines, it is just that they took much longer to open up and come alive, while the 2008 is more forward and no less complex or deep in layers. The palate has wild plums, blueberry, currants, tangy blackberry fruits and mixed compote with fennel, lavender and dried herbs and grilled meat. Hints of smoke, pepper and crème de cassis are subtle in the background. The finish on this wine is sweet and savory, lasting a long time; again this is a truly fine and interesting wine that is worth finding if you can. If you are interested in this or one of the wines reviewed on grapelive.com feel free to email me, and I’ll try to help you get it. This new single vineyard Pinot from Calera is fantastic and in my mind the best young Calera Pinot Noir I’ve ever had! While Calera Pinot always seem to become outstanding wines with age, they rarely taste this good on release and I think the vintage may have helped, but I am very impressed by this vineyard and recommend Pinot lovers rush out and grab it by the case at the release price! The nose is full of fruit and flowers and the flavors explode on the palate, even though most people compare Calera to great Burgundy, I think Burgundy would be very flattered to be talked of in the same breath! This is the real deal and a remarkable Pinot Noir with depth, style, vibrant flavors and layers of complexities, plus it is still young and will only get richer and more vivid! Roses, violets, black currant, cherry, plum and mixed berries all come flowing out on the nose and palate. The mouth feel is wonderful and ripe with a background of savory spice, lavender and smoky sweet oak notes with everything balanced to near perfection. 2008 Brewer-Clifton Chardonnay “Sweeney Canyon” Sta. Rita Hills. Okay, right off the bat, I’ll tell you this Chardonnay is not for the Rombauer crowd, it is more for a select few of enthusiasts that go for Chards that don’t really taste like run of mill Chards. This vintage is like Chablis Grand Cru meets Riesling from Alsace! It sounds crazy and geeky, but this wine is cool and seductive, I could not get enough of it and look forward to trying it again! Steve Clifton told me that there was a trace amount of Riesling and Sauvignon Blanc in this vineyard and all the grapes are picked like a field blend, which is why it is so unique, even though there is at least 90-92% Chardonnay in the final wine. Steely with honeysuckle, jasmine, apricot, pear, mineral spices. Edgy and bright though opens up with time to reveal apple and lemon, with brioche and quince. I love this wine, might just be my personal favorite, I could easily rate it a few points higher..
*If you are interested in Brewer-Clifton wines drop me an email, and I’ll help you get them!